The air we breathe is essential for life itself, but cooling and conditioning to create a comfortable climate is also important as is ventilation and circulation. Air Cup brings you an information resource on clean air solutions that you can use to gain a more comprehensive understanding of our life giving atmosphere and how we can condition it to make our lives more comfortable as well as improve health by reducing pollutants that may harm us. There are many appliances available that can do these jobs for us and provide us with a clean and unpolluted medium to breathe in our homes and workplaces while helping to maintain a comfortable climatic environment worthy of our technological advancement. The more commonly seen kind of climate controlling systems in offices and public buildings are large HVAC or heating, ventilation, air conditioning systems that replenish the air, circulating and cooling and in many cases purifying too. It really depends on the make and model as to the kind of air processing that is done, but most of the time the chances are the air you're breathing in public buildings and workplaces is clean enough. Fixed air conditioning installations are fine for larger buildings and public places and they are even cost effective to a point. But for smaller buildings such as domestic homes and small offices, it can become uneconomical to run a large AC system especially if multiple rooms are used by lots of different people and chances are units will be left turned on in vacant rooms. While there isn't much that can be done about people simply forgetting to turn off AC units in a room when they leave aside from reminding everyone of their civic and environmental duties, a more economical solution can be found in using smaller, standalone portable or free standing units. 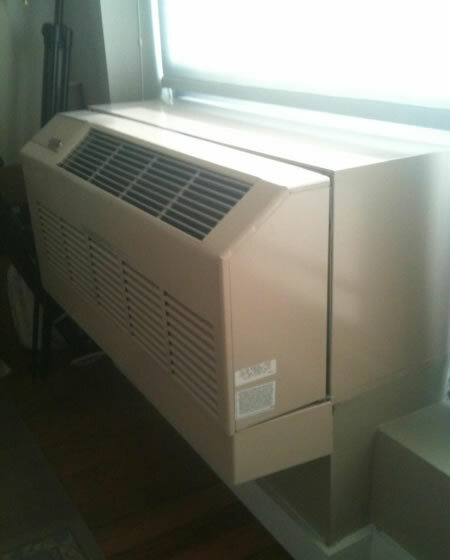 A single, small portable AC unit sited in a room that is occupied can be more economical simply because it uses less power than a larger fixed unit. There is one major drawback with portable units and that is they need to be vented to the outside and this is generally done using a length of flexible plastic ducting hose connected to a window venting kit. Needing to limit a portable unit's actual portability by needing to have its vent fixed to an external wall outlet of some description sort of negates its usefulness as a mobile unit. However, since purchase costs are usually much lower than a fixed unit and there are no installation costs involved, many people opt for this kind of appliance to keep cool. The problem with air conditioners is they do use a lot of power to effectively cool a room to a comfortable temperature. Two or three kilowatts or more is common and when this amount of power is consumed over the space of a full waking day, costs can soon mount up. There is a more economical cooling solution for those in the right circumstances. There are cooling appliances that don't use the refrigeration process that true AC utilizes to produce old air, but instead rely on cooling the air by evaporation of moisture, circulating this chilled air around a room using a powerful internal fan. These units are much cheaper to run since they have no compressor to power, typically running at between 100 and 200 watts. This is as much as 1/20th of the amount of power used by ACs, meaning energy costs are that much lower as well! There is a major drawback to these appliances that is very different to that of air conditioners. Evaporative coolers only work in dry climates. If the air gets humid in your location, you are out of luck as they simply don't produce any cooling effect at high humidity levels. For more detailed information, we recommend you visit: https://ventlessportableairconditioner.intervalinc.com which is a highly specialized and informational resource on ventless portable air conditioners (better known as evaporative or swamp coolers). These are coolers that have no need of a vent or exhaust hose, making them completely self-contained, compact and portable. Everyone has a choice as to how they elect to maintain a comfortable indoor temperature in homes, offices and other buildings. If you can afford air conditioning, this is generally the best solution except in areas that have naturally dry heat in which case you can save a small fortune by opting for evaporative cooling. Of course, there is the even cheaper option of having no cooling at all, but in some areas that have punishingly high temperatures, it all comes down to how comfortable you want to be, or not as the case may be.